Metis records will accompany in music the manners to taste the tea in the world. With the project Tea Ritual Sound, a history of family between Lydia and Olivier Kaba, The tea box includes a book describing 10 rites of tea in the world and a CD illustrating musically every stopover. Original titles are played by prestigious musicians such as Vincent Budher with the harmonica, Estelle Goldfarb with the violin, Jiang Nan with Guhzeng … A delight!. The book, written by lydia Gautier is a magnificent travel. The tasting of a small cup of tea together with our friends is a moment, of relaxation ,of plenitude in our noisy and stressful everyday life. Ten stopovers are proposed to us, China, Japan, Taiwan, India, western Africa, North Africa, United Kingdom, the USA, Brazil, Russia with the rites of the tasting of the tea but also the conditioning of our spirit towards the nation which we chose. 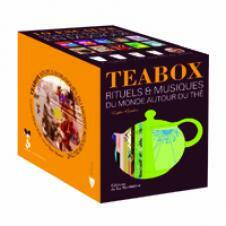 this tea box is planned in November 2010 at Aubanel Editions .